Dusty Perin is a visual artist with a camera. Her love affair with photography and horses began at age 12, it was the means to capture and savor her summer horse memories throughout the year. 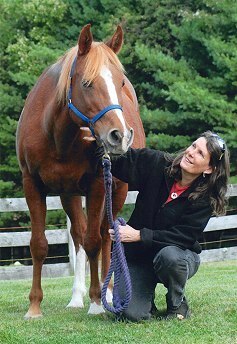 A self taught photographer with an Associate of Science degree, she is both a horse woman and horse owner. Her professional career as a photographer began in 1989 in the field of wildlife photography. It changed direction in the early 1990's when editors began selecting more and more of her equine images. She soon realized her expertise as a photographer would be better spent on the subject she knew the best, horses. Dusty's editorial images have appeared in hundreds of magazines and books. She uses her past experiences, working in horse related fields such as riding, driving, instructing and stable management, to give her special insight into her subject. Her images translate the many aspects of the horse world in a clean descriptive style. When she finds the time to ride, she has horse trekked in a variety of places including France, New Zealand and Australia. She has a strong appreciation of all facets of the equine world especially the different breeds and disciplines. Her favorite saying is "The most beautiful horse in the world is always the one in my viewfinder!" All Rights Reserved © 2011 Dusty Perin Photography, LLC.